Cohesity provides the only hyperconverged platform designed to eliminate secondary storage silos. Cohesity consolidates all secondary data and associated management functions on one unified solution -- including backups, files, objects, test/dev copies, and analytics. 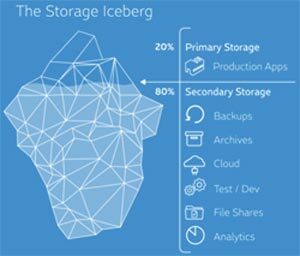 Secondary data consumes about 80% of enterprise storage and imposes a huge burden on enterprise IT budgets. Secondary data is traditionally stored on a complicated patchwork of point appliances for backups, files, objects, test/dev copies, and analytics data. This infrastructure is fragmented, complex to manage, and inefficient. Control all your secondary data operations with converged data protection, automated DR and cloud migration, and DevOps automation. Reduce your secondary storage TCO. Cut hardware requirements, eliminate software licenses, and simplify management. Traditional secondary storage is fragmented and inefficient. It consumes about 80% of enterprise storage capacity as data is copied on average 10 to 12 times across individual storage appliances in support of different use cases like backup, analytics, test/dev, files and objects. To move data to the public cloud, organizations have to deploy yet another silo in the form of a cloud gateway. Cohesity transforms this complex infrastructure with a simple, elegant solution. Cohesity DataPlatform eliminates secondary storage silos with a single, purpose-built hyperconverged platform. The Cohesity solution enables organizations to cut their total cost of ownership by 80% or more compared to traditional solutions.